With help from tech giants that call San Francisco and its surrounding cities home, the Bay Area Super Bowl Host Committee on Thursday announced it raised some $40 million to be put toward hosting the championship game in 2016. Apple, Google, Yahoo and Intel each chipped in $2 million in cash and services to offset taxpayer dollars associated with bringing the historic 50th Super Bowl to the San Francisco 49ers stadium in Santa Clara, reports the San Jose Mercury News. In exchange for their donations, the tech companies will receive a Super Bowl 50 suite and official publicity consideration. According to the publication, any burden on local taxpayers is expected to be fully paid off by the total $40 million in private funding. The Super Bowl Host Committee was able to raise $30 million in 2013, with the funds going toward traffic control, overtime for police officers and other infrastructure costs that come along with bringing the nation's biggest sporting event to town. Previously themed as the "SF Super Bowl," the new "San Francisco Bay Area" moniker was officially selected to represent a wider swath of the region. The committee is reportedly pushing Bay Area sights ahead of the game, though most activities will take place in San Francisco and Levi's Stadium in Santa Clara. 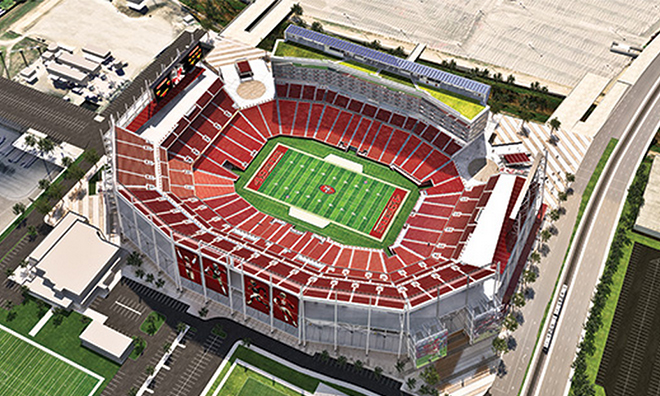 Set to open in two months, Levi's Stadium cost $1.3 billion to build and is located near the Santa Clara Convention Center, a 20-minute drive from Apple's Cupertino, Calif. headquarters. With the $2 million investment, Apple may make a return to the Super Bowl advertiser's list after being absent for nearly 15 years. Apple helped foster the trend of "blockbuster" Super Bowl television commercials with its iconic "1984" Mac spot, but the company has been silent since 1999. Its final Super Bowl ad featured HAL 9000, the sentient supercomputer from the movie 2001: A Space Odyssey, taking jabs at the Windows Y2K bug. Many anticipated Apple would make a return to Super Bowl ad making this year in commemoration of the Mac's 30th anniversary, but the company instead commissioned Jake Scott —son of legendary director Ridley Scott who filmed the "1984" spot —to create a special short film using nothing but iPhones, iPads and Macs. The ad was subsequently released online as part of the Mac 30 media campaign.